219 Beacon is located on the south side of Beacon, between Clarendon and Dartmouth, with 217 Beacon to the east and 221 Beacon to the west. 219 Beacon was built ca. 1866 for merchant, cotton manufacturer, and real estate developer Charles William Freeland, for speculative sale, one of five contiguous houses (211-213-215-217-219 Beacon) designed as a symmetrical composition, with 211-213 Beacon and 217-219 Beacon having shared porticos and full bays, and 215 Beacon, in the center, having no bay. Originally numbered 199-207 Beacon, they were renumbered 211-219 Beacon by 1868. “A block of five brown-stone fronts is to be started immediately upon the land…which has been purchased by C. W. Freeland, esq. These houses are to be built from plans drawn by Messrs. Ware and Van Brunt and are to be constructed of first-class materials. Mr. Hammond, who has been superintending the building of Mr. Beebe’s elegant house on the old Hancock estate, is to be the builder of this block.” James Beebe’s house was located at 30 Beacon; the builder probably was John Hammond, a carpenter and housewright. 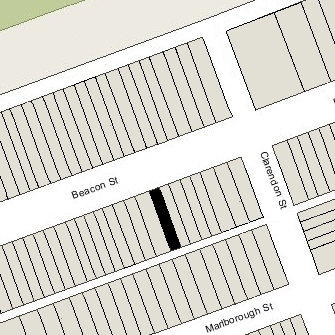 Charles Freeland purchased the land for 211-219 Beacon on April 17, 1866, from the Commonwealth of Massachusetts as four 25 foot wide lots, which he then subdivided into five 20 foot wide lots. Click here for an index to the deeds for 219 Beacon. In 1874-1874, Charles Freeland had two additional contiguous houses, 205-209 Beacon, built for him to the east, designed by Peabody and Stearns. On October 13, 1870, 219 Beacon was purchased from Charles Freeland by Mary (Ruggles) Mixter, wife of William Mixter. William Mixter was a merchant and banker. He also owned a farm in Hardwick, Massachusetts, where the Mixters lived for a large part of the year. The Mixters’ adult children — George, Mary Ann, Fanny, and Samuel Jason Mixter — lived with them. Samuel Mixter graduated from Harvard Medical School in 1879 and married in August of 1879 to Wilhelmina Galloupe. They lived at 219 Beacon with his parents and in Europe (their son, William, was born in Vienna in December of 1880); by the 1881-1882 winter season, they had moved to 180 Marlborough. Fanny Mixter married in February of 1881 to Daniel Waldo Howard and they moved to Philadelphia, where he was a professor of history. Mary Mixter died in October of 1904. In her will, she left 219 Beacon and the Mixter property in Hardwick to her daughter, Mary Ann. Mary Ann Mixter and her unmarried brother, George, continued to live at 219 Beacon. George Mixter was a banker and also raised pure-bred Guernsey cows at the family farm in Hardwick. George Mixter died in August of 1910, and Mary Ann Mixter continued to live at 219 Beacon. By the 1911-1912 winter season, she had been joined by her niece, Dorothy Howard, the daughter of Daniel and Fanny (Mixter) Howard. 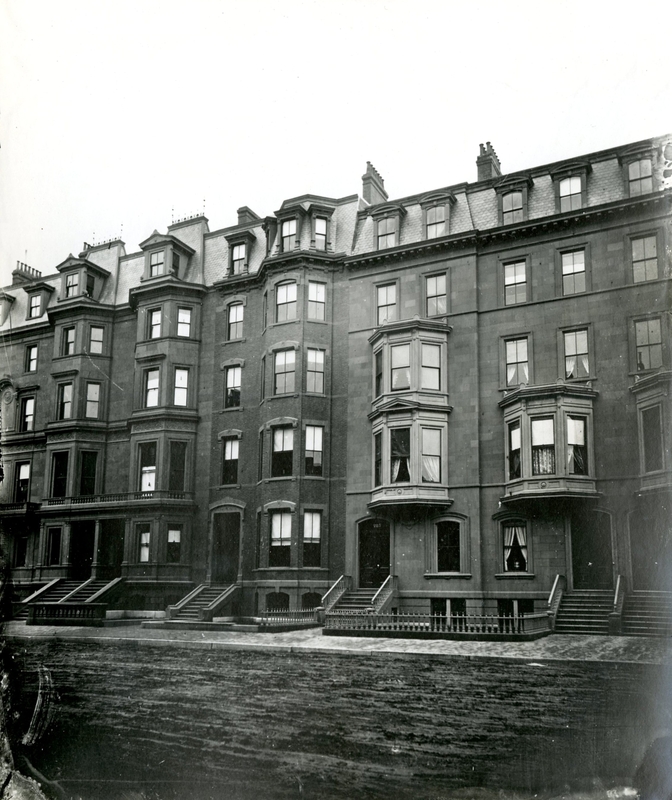 Mary Ann Mixter and Dorothy Howard continued to live at 219 Beacon 1919, but by 1920 had moved to 180 Marlborough to live with Samuel and Wilhelmina MIxter. By the 1919-1920 winter season, 219 Beacon became the home of Samuel and Wilhelmina Mixter’s son and daughter-in-law, Dr. William Jason Mixter and Dorothy (Fay) Mixter. They previously had lived at 42 Fairfield. William Jason Mixter was a physician in partnership with his father and his brother, Charles Galloupe Mixter, with offices in Samuel and Wilhelmina Mixter’s home at 180 Marlborough. Mary Ann Mixter died in June of 1922 and Samuel Mixter inherited her property, including 219 Beacon and the family property in Hardwick. 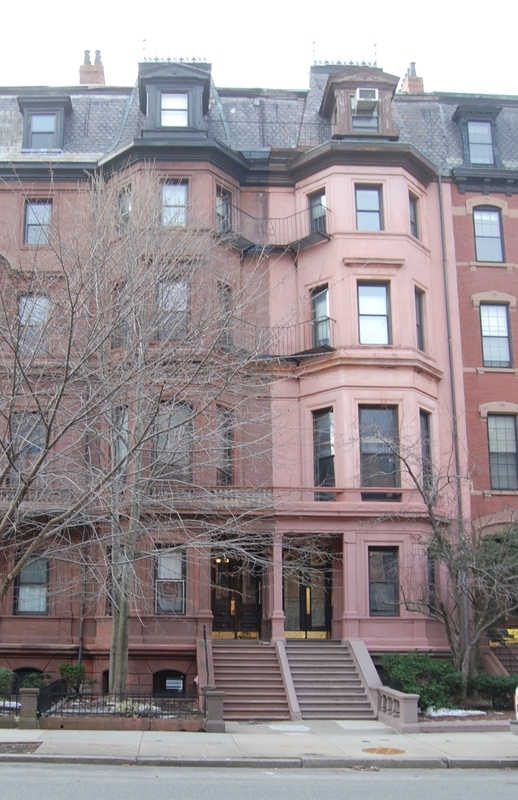 In about 1923, William and Dorothy Mixter moved from 219 Beacon to Brookline, and Samuel and Wilhelmina Mixter moved from 180 Marlborough to 219 Beacon. 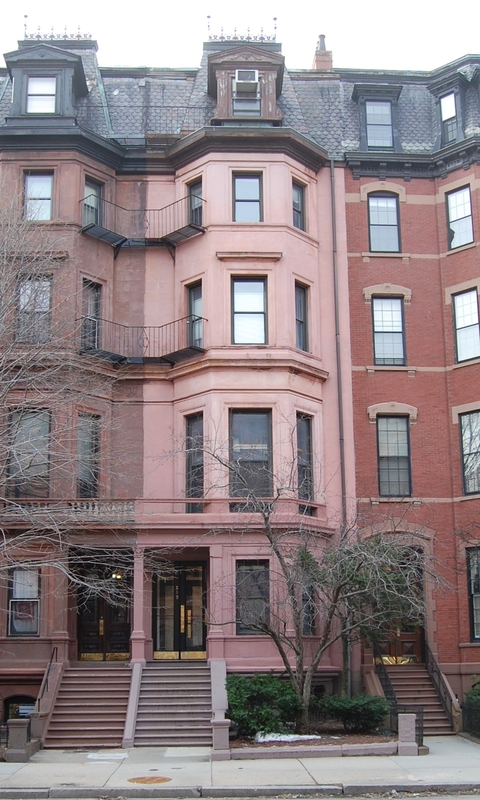 At the same time, Samuel Mixter retired from practice, and William and Charles Mixter moved their offices from 180 Marlborough to 270 Commonwealth. Wilhelmina Mixter died in January of 1925, and Samuel Mixter died in January of 1926. On January 10, 1927, 219 Beacon was acquired by Miss Lucretia Blanche Hackett, who operated it as a lodging house, called Copley House. She continued to live there and operate it as Copley House until about 1937, when she moved to 11 Hereford. On August 10, 1937, real estate dealer Henry C. Brookings foreclosed on a mortgage given by Blanche Hackett and transferred 219 Beacon to Elina M. Johnson. On September 21, 1927, it was acquired from her by Dorothy A. Palmer of Waterville, Maine. Earlier that month, she also had acquired 217 Beacon. 219 Beacon was shown as vacant in the 1938 and 1939 City Directories. On August 30, 1939, 217 Beacon and 219 Beacon were acquired from Dorothy Palmer by Adelard Monet, a former dealer in furniture and household goods. He lived at 377 Beacon, where he also operated a lodging house. On November 1, 1944, 219 Beacon was acquired from Adelard Monet by Clifford Clovis O’Brien and his wife, Alice (Lorette) O’Brien, who operated it as a lodging house. She previously had lived at 170 Huntington with her son-in-law and daughter, Robert Dubray, who was serving in the US Army, and Gloria Rose (O’Brien) Dubray. Clifford O’Brien was living elsewhere, probably in Peterborough, New Hampshire, where he was employed at the Peterborough Hospital. He had joined her at 219 Beacon by the early 1950s. On July 3, 1951, 219 Beacon was acquired from the O’Briens by Allen Payson Saul (born Abraham Salinsky). He was a chiropodist and operated the Allen Payson Company, dealers in elastic stockings. He was unmarried and lived at 35 Marlborough. In November of 1951, he filed for (and subsequently received) permission to convert the property from a lodging house into twelve apartments. By 1952, Allen Saul’s sister, Della Saul (the former wife of George Lapidus and of Jacob Newman) was living in one of the apartments with her son, Robert Jason (Lapidus) Saul. In 1951, before she separated from Jacob Newman, they had lived at 14 Buswell, and before that at 35 Marlborough with her brother. She, too, was a chiropodist. By 1953, Della Saul had moved to an apartment at 140 Beacon and was living with her brother, who moved there from 35 Marlborough at about the same time. On August 19, 1985, 219 Beacon was purchased from Allen Saul by Caesar J. Balzotti, trustee of the 219 Beacon Street Realty Trust. 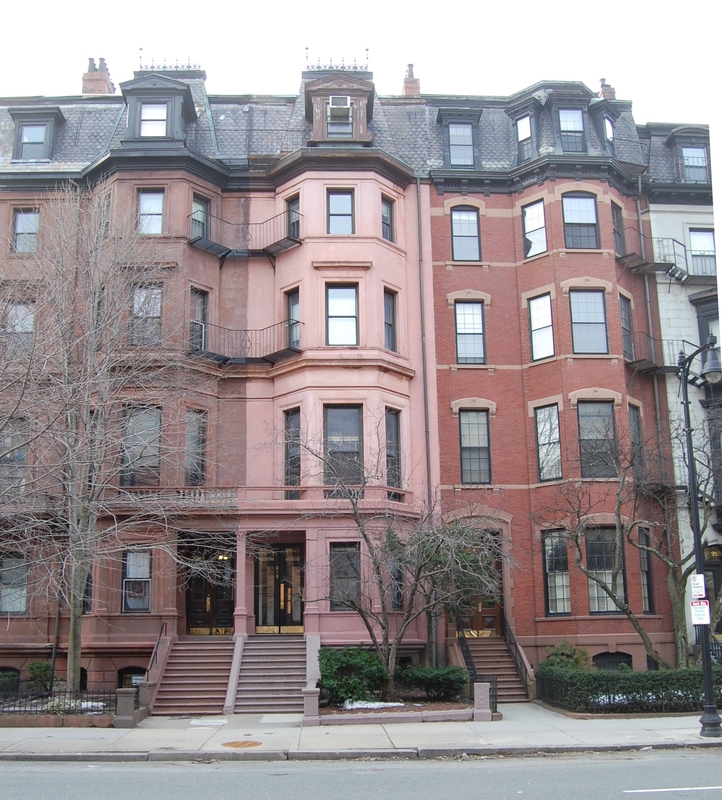 On October 31, 1985, he converted the property into twelve condominium units, the 219 Beacon Street Condominium..